I have voted for Life as I love tanking and Crusaders look awesome. But I think I'll try Sorcery as well as I would like to dig the spell system and that class seem the best for this. Lioness: One thing to keep in mind is that Perks are unlocked a bit later in Siralim 2 than they were in Siralim 1. (Zack said roughly two hours into the game -- depending on play speed obviously). That might effect how one evaluates early-game perks. Necromancy is temporary and everything turns back to normal after battle. The creature will have slightly higher stats than the original creature. Yes, you can change your class later on just like in Siralim 1. Chaos: Like in S1, switching to this later for Pandemonium Presence. Casting a random spell even for free seems too RNG to be useful. Life: Guiding Light, while not as good as Farsight, still seems a huge timesaver for finding objects if walking speed in realms is as slow as in S1 - it'll feel painful not to have this. Nature: I guess Lone Wolf's 'missing from group' doesn't mean dead but that you entered the battle with less than your max amount of creatures, so might be worth it only at the start of the game when you may not have worthwhile creatures to fill the new slots that open up - it also appears to be in conflict with Hybridization since that wants all party slots filled. Take up the Gauntlet seems good at first but can backfire horribly if the Provoker gains something from being attacked. Sorcery: Random spells which means inconsistency (but could be useful for creatures that have a chance to attack multiple times if it triggers each time), and Mana can probably be replenished by items, so meh. Been looking in every now and then, but now its "just around the corner". Unreal hype! I dont really remember, but I think it was possible to change your class in Siralim 1 right? Either way, is this available to do in Siralim 2? Probably going to start with Nature, love the Hybridization ability as I like playing diverse team builds that don't rely on one particular class. That being said they all look great and I'll probably do a few hours of each just to get a feel for them all. I am curious about how the necromancy effect will work. Is it changed permanently? Will the new creature have the same level , stat bonus as the original troop? For now i am looking at the life mage but i am not sure if defense is the way to go in S2 since S1 attack and speed are more important. My other choice will be the sorcery mage. Spells seems like they would be fun to use in S2. Added a poll to my main post! Which class will you choose? 1) Each creature must have a trait that is basic and easy to understand for players new to Siralim. 2) Each creature should be relatively unique from each other and give a basic idea about what you can expect from its respective class. 3) Each creature should be powerful enough early on that you can afford to make a few mistakes without getting severely punished. Ultimately, this meant that a few of the starting creatures are from Siralim 1, but it's way better than sabotaging new players with complex traits that they won't understand or be able to utilize effectively early on. Graft does not have a cap, but it only works in normal battles and there is a finite number of "normal battles" per realm. On average, there are 6-8 normal battles per realm. Lone Wolf does not work with Thylacine. This actually works in your favor, though, because your Thylacine's traits all grow more powerful for each Hound fighting on your side. Does Graft have a cap? Lone Wolf work with Thylacine? I am thinking I am going to go with Death if Graft does not have a cap or if it stacks up to a decent height. Out of curiosity, given the huge number of creatures in Siralim 2, how did you decide which pair of creatures each class should start with? Excited about the impending release of Siralim 2? You should probably choose your starting class ahead of time, then! This post will very briefly discuss each of the five classes you can choose. Note that while some of the classes start with creatures that are originally from Siralim 1, the secondary starting creature for all classes will be a Siralim 2-exclusive creature. However, those won't be named here. 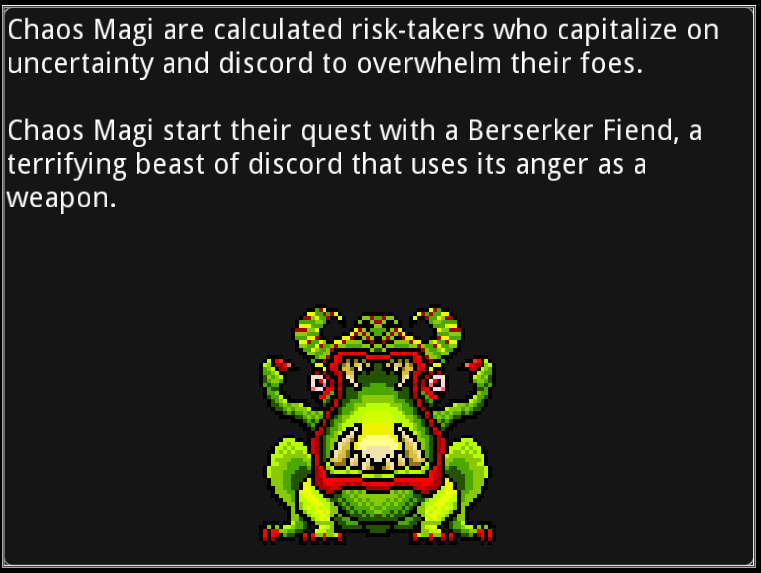 Yes, the Berserker Fiend is back and available early on to chaos magi. I've only tried 3 of the 5 classes so far, but I think this is probably your best bet if you're new to the game. The Berserker Fiend absolutely dominates early on with its ultra high Attack stat. It also has pretty high Speed, meaning it has a decent change to dodge attacks or deal critical damage. The Berserker Fiend's trait is called Outrage, which causes it to always have the Berserk buff. In Siralim 2, Berserk causes the creature to deal 100% more damage but take 50% more damage as well. This means that the Berserker Fiend can generally kill enemies in one hit, but due to its low Defense stat, it also dies very easily. Additionally, your first spell gem is called Aftermath. Aftermath afflicts the target with Vulnerable (which causes the creature to take 50% more damage), then the caster immediately attacks it 3 times for 35% normal damage. Chaos Magic: Your creatures' Defend command is replaced with the Chaos Magic command. Chaos Magic causes your creatures to cast a random Chaos spell for 0 Mana. Sacrifice at Dawn: Your Life creatures can equip Nature Spell Gems. 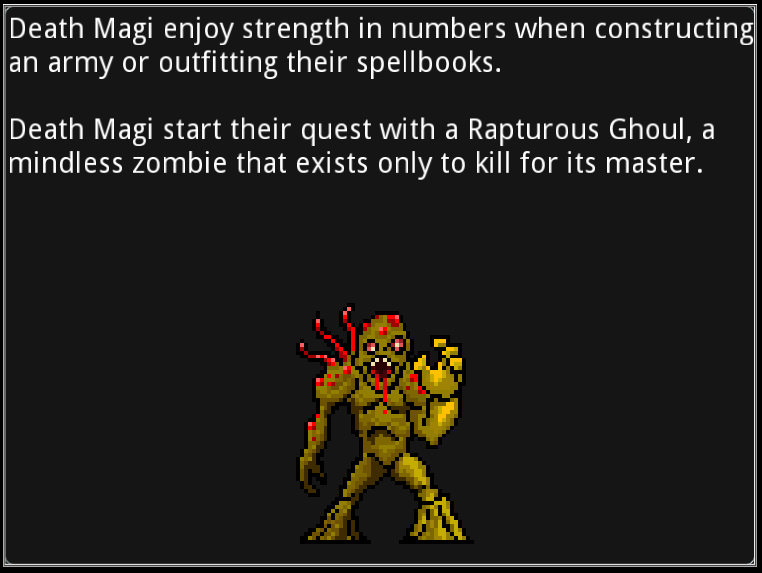 The death mage starts with a Rapturous Ghoul, which has the Ravage trait. Ravage causes the creature's attacks to deal additional damage equal to 65% of its Speed. This is a pretty big deal considering Speed is already a very useful stat on its own, so you'll likely see this creature dealing a high amount of critical damage with its attacks. Death magi start with the Shadow Infusion spell gem. Shadow Infusion grants a large amount of Speed to the target, which is perfect for your Rapturous Ghoul! However, since ghouls tend to have low Intelligence, this spell won't be very powerful if your ghoul uses it. Maybe the secondary creature you receive will be better-suited for casting? Necromancy: Your creatures have a chance to resurrect as a random Death creature when they die. Corpse Defilement: After your creatures kill an enemy, there is a chance that the creature cannot be resurrected again. Graft: After winning a normal battle in a Realm, your creatures gain 5% Attack, Intelligence, Defense, Speed, and Health in normal battles. This effect resets after you leave a Realm. 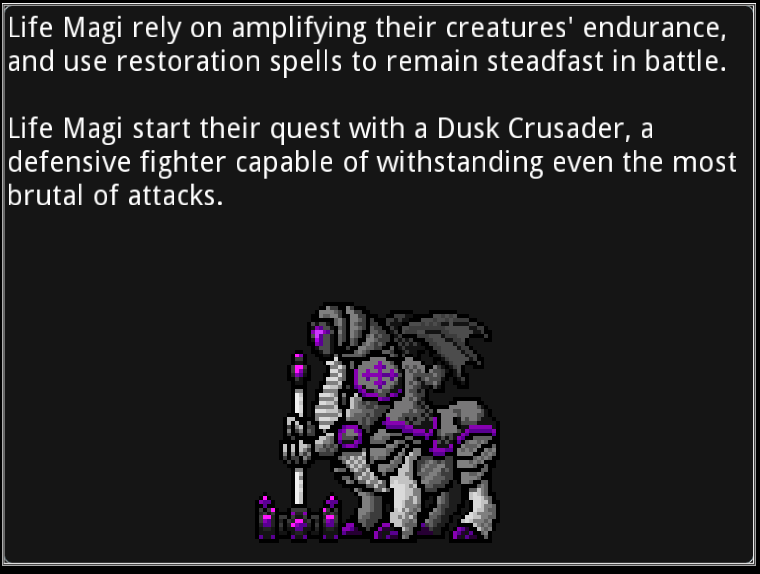 Life magi start with a Dusk Crusader, which belongs to the self-sustaining tanking race of crusaders. Dusk Crusaders have the Amalgamy trait, which increases their Defense each time they attack. After attacking only a few times, your Dusk Crusader could have so much Defense that it no longer takes damage at all! This is also true for enemy Dusk Crusaders, however, and have caused my party to wipe out several times so far. It's best to take these guys out as quickly as possible before they become immortal. To supplement the Dusk Crusader's already high survivability, you're also given the Holy Smite spell gem. Holy Smite deals a small amount of damage to the target while also healing the caster for a small amount of health as well. Flash Healing: When your creatures take damage, they have a chance to cast Minor Healing on themselves. Overheal: When one of your creatures are healed, and the amount healed exceeds the creature's Maximum Health, store the extra healing in a Barrier. The maximum strength of the Barrier is equal to a certain % of the creature's Maximum Health. 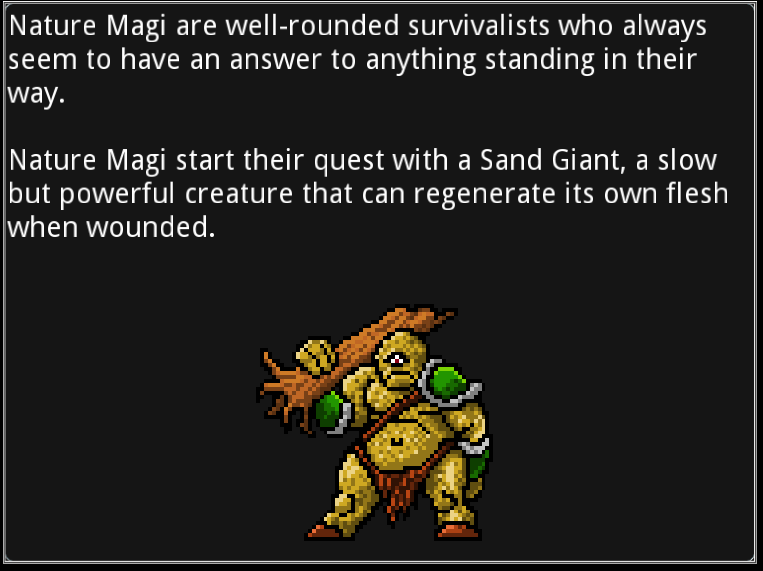 Nature magi start with a Sand Giant, which has the Rapid Regeneration trait. Rapid Regeneration causes the creature to recover 50% of its missing health at the start of its turn. Giants also have naturally high Attack, making the Sand Giant a very well-rounded creature to start out with. As you might imagine, though, giants have extremely low Intelligence, so they aren't very good casters. Despite that, nature magi start with a Shellbust spell gem, which reduces the target's Defense and then deals damage based on the amount of Defense reduced. This is a great way to soften up tough enemies like the Dusk Crusader, mentioned above! Take Up the Gauntlet: When an enemy provokes, each of your creatures have a chance to immediately attack it. Hybridization: Your creatures have 10% more Health, Defense, and Speed for each different class of creature fighting on your side. 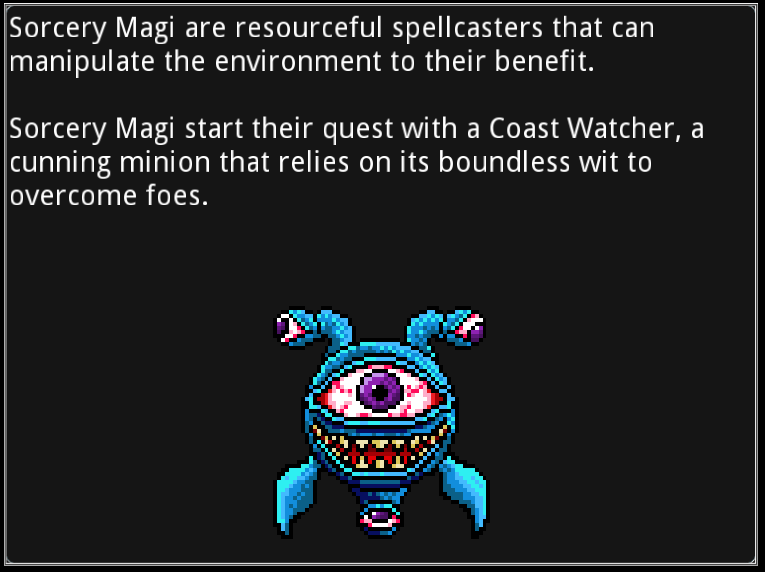 Sorcery magi start with a Coast Watcher, which has the Baffle trait. Baffle causes the creature to deal extra damage with spells and attacks equal to the amount of Intelligence it has greater than its target. It's worded less-confusingly in-game, don't worry. In addition, sorcery magi start with the Spellstrike spell gem. Spellstrike deals a moderate amount of damage to the target, but 50% of this damage is based on the caster's Attack stat rather than Intelligence. While this spell is powerful enough for your Coast Watcher to deal heavy damage to creatures early on, you might consider giving it to a different creature that has high Attack later on. Wild Magic: Your creatures are each given a random class-appropriate Spell Gem at the start of battle. Meditation: Your creatures' Provoke command is replaced with the Meditate command. Meditate causes a creature to recover all its Mana.